1. Sometime when I was 13 or so, I dedicated my life to Satan. I’m sure someone dared me to do it, but I don’t remember. Which means I had a witness — my brother, or my cousin — other than smiling or frowning deities, but I can’t recall for sure. I do remember thinking about my poor parents if the whole infernal plan backfired: how they would have to find an exorcist in case I started levitating from my bed. Or have to clean up the thick green soup I’d spew onto the walls. I was still there. I was still breathing. My head neither sprouted horns, nor was zapped by a bolt of punitive lightning. I had not been bestowed with powers of clairvoyance or the ability to hurl small objects across the room with my mind. My life of evil, ending before it even began. My bedroom was still there, and it looked the same. My bed, my brother’s bed, our Duran Duran and Spandau Ballet posters on the wall. 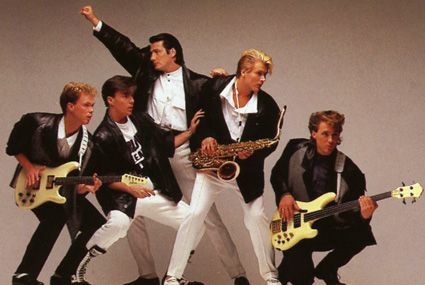 That one, with Tony Hadley facing the other direction as the rest of the band. Years later I dedicated myself to Christ — a long story I shall not go into here — and was confirmed and baptized by immersion in holy water. That moment was accompanied by all the appurtenances of ritual designed to heighten the experience: the robes, the prayers, the congregation. I was waiting to be filled by the Holy Spirit. Would it feel like a tingle in my spine? A sudden lightness in the soles of my feet? The clouds didn’t part, no dove descended from the sky, and no angelic choirs sang. Looking back, I figure Satan just didn’t have any wonderful plans for my life. He simply had no use for a young uncorrupted Spandau Ballet fan, momentarily acting out in pimply teenage malaise, with no experience in the pleasures of the flesh. I wanted Satan in my life, but the old guy, ever the practical schemer, didn’t want me back. Which leads me to more demons, circa 1775, via The Paris Review. 2. Leslie Jamison, “Catechism for the End of the World,” an introduction to Ryan Spencer’s “Such Mean Estate” (The New Yorker). 3. Claudia Rankine, “The Condition of Black Life is One of Mourning” (New York Times Sunday Magazine). 4 and 5. Alexander Chee on James Salter, from 2011. Then follow it up with an excerpt from A Sport and a Pastime, from 1966 (The Paris Review). 7. Mark Thompson is the deceptively affable fellow behind the monstrosity-filled Monstark Studios. I picked up his books at a local art fair recently and his books — especially Lepustrosities: Experiments Successful and Bugmen who Bear My Nose — are eloquent and horrid, suggesting a bestiary written by Lovecraft and Ligotti. Ten songs, 28’05”, voice never raised above a murmur: utter perfection. A music barely there, like pollen on a summer breeze, the drowsy strings not slathered all over everything, but coming and going like midnight optimism. Sinatra sings lines like ‘tall and tan and young and lovely’ – all these clicky, tricky consonants like soldiers on guard duty – and yet when you recall his voice it’s a soft, uncurling wave. 10. “Is it possible that what we think of as genre boundaries are things that have been invented fairly recently by the publishing industry?” Kazuo Ishiguro and Neil Gaiman talk about “genre” (The New Statesman).